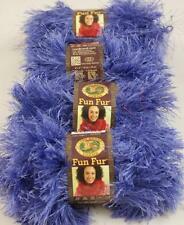 "Fun Fur Yarn-Red, Set Of 3"
Color 9512 Lot 8460. Made in Turkey. Glitter Eyelash Yarn, BROWNSTONE. Color: Brownstone #522. 50 grams per skein / 64 yards per skein. Color: Violet #191, Purple. Write if you need a certain lot number and we will confirm. Easy to use novelty "eyelash" yarn. Use for entire projects, for trim or combine with other yarns. Fun fur is the go-to-yarn for that luxurious fur look. Color #207 ~ Citrus (Bright Green, Blue & Yellow blend). Color: TROPICAL #208;blues, purples, pinks, greens. Get free patterns on manufacturer's site. 40 grams per skein / 57 yards per skein. Color: Ginger #216. 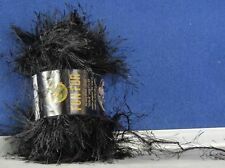 A novelty eyelash yarn. Use for entire projects, for trim or combine with other yarns. Features: weight category: 5, 100% polyester, Solids: 1.75oz/50g (64yd/58m), Prints: 1.5oz/40g (57yd/52m), Gauge: knit: 16 stitches x 26 rows = 4in (10cm) on size 10.5 (6.5mm) needles, Crochet: 12 sc x 14 rows = 4in (10cm) with size K10 (6.5mm) hook. Color: Indigo #203 - Varigated Blue. 40 grams per skein / 57 yards per skein. This yarn is like "denim" color when done up - very chic (pretty). 40 grams per skein / 57 yards per skein. Color: Indigo #203. Get free patterns on manufacturer's site. 50 grams per skein / 64 yards per skein. Color: Violet #191. 50 grams per skein / 64 yards per skein. Color: Magenta #146. Get free patterns on manufacturer's site. One skein is black; the other one is white. 3 SKEIN LOT. 40 grams, 57 yards per skein. Color #301 : The colors are aqua, chartreuse and pale pink. Get free patterns on manufacturer's site. Fun fur is that go-to -yarn for that luxurious Fur -look. Product care instruction: Machine washable and dryable. Made is the Turkey. Weight category 5. Color #102 - Flamingo. Each skein - 1.75 oz. Each skein - 1.75 oz. Color #124 - Champagne. Color: Purpletini #192. 50 grams per skein / 64 yards per skein. Label type and lot may vary - write if you need a certain lot number and we will confirm. Get free patterns on manufacturer's site. 50 grams per skein / 64 yards per skein. Color:Flamingo#102, Hot Pink. Get free patterns on manufacturer's site. This bulky yarn is perfect for knitting and crocheting projects! Weight category: 5. Content: 68% Nylon/32% Polyester. Putup: 1.75oz/50g; 47yd/43m. Gauge: 14s x 17r = 4in/10cm on size US11/8mm knitting needles. Lot #3565. Free scarf instructions on inside of label. Made in Turkey. Trending at C $14.21eBay determines this price through a machine-learned model of the product's sale prices within the last 90 days. /39 yards each -discontinued. Color 267 Strawberry Fields-- black plied with red, green and dark orange pompoms. Fancy Furdiscontinued. Product Care Instructions: Machine wash. Initial water temperature should not exceed 40C or 105F. 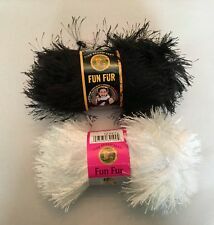 Available in a variety of colors and a free pattern on label, you can use this fur yarn to make trendy fur coats, scarves and handbags. Color: Fiesta. Lion Fun Fur Yard. Type: Yarn. Care: Machine wash or dry clean/machine dry; do not iron or bleach. 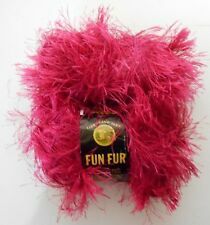 5 out of 5 stars - "Fun Fur Yarn-Red, Set Of 3"
1 product rating1 product ratings - "Fun Fur Yarn-Red, Set Of 3"
Trending at C $17.71eBay determines this price through a machine-learned model of the product's sale prices within the last 90 days. Easy to use novelty "eyelash" yarn. Use for entire projects, for trim or combine with other yarns. Fun fur is the go-to-yarn for that luxurious fur look. Color #215 "Capri" Blue, Green, White Multi Color. Trending at C $17.31eBay determines this price through a machine-learned model of the product's sale prices within the last 90 days. Up for sale is for 2 skeins of Fun Fur yarn color "VIOLET" LITE PURPLE Fun fur is that go-to -yarn for that luxuriuos Fur -look. Product care instruction: Machine washable and dryable. Weight category 5. 3 skeins, of this fun faux fur yarn, bright red color, 1 1/2 oz, 50g, 60 yards. Can knit or crochet scarves, hats, or as an accent on gloves. Includes cute scarf pattern on label. International may take longer. Color #81105 "Blue Bird" Blend of several blue shades. Bernat BoaYarn - Eyelash, novelty. Easy to use novelty "eyelash" yarn. Use for entire projects, for trim or combine with other yarns. Fun fur is the go-to-yarn for that luxurious fur look. 3 skeins LOT. Sand Stone. 60 yards each. We work hard to describe each item carefully and add adequate pictures. If you think that might be the case, we will eagerly give you a direct quote upon knowing your zip code. 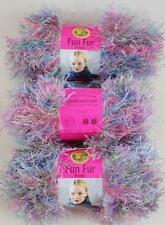 "Fun Fur Yarn-Lava Print, Set Of 3"